It’s been a long week. I’m probably going to say that at the end of every training week forever more as I am a bit of a moaner. Anyway I promised a little recap as to how the week had gone running wise and I’m sure after your Sunday roast you’ve spent the rest of your Sunday biting your nails waiting for it! After trawling through the millions of available guides on Google I’ve gone for using a Bupa Half Marathon Training Guide as a base and adapting it to my lifestyle. 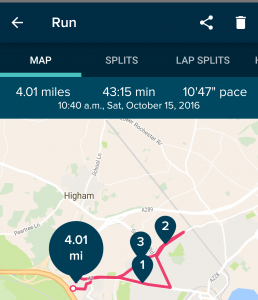 I have the luxury of working from home through the week but am out working most Sundays so my long runs I’ve decided will be on Saturdays. This training plan suggests 3 runs through the week plus 1 long run (although this week I only managed 2 plus 1 long – good start!) As it was the first week it was just 30 minute easy runs through the week and a 3 mile run at the weekend, but as I was ran 3 miles during the weekday runs I upped the long run to 4 miles. So Monday it all began. I laced my trainers, popped my new Fitbit Surge on my wrist (review for that coming soon), stepped out the house, started running and immediately wanted to die. Why did I sign up for this?! One mile hurts! Every bit of running bloody hurts! What on earth will 13 of the devils feel like on a freezing cold Sunday morning in February!? Once I got past mile 1 I calmed down a bit. I wouldn’t say it was enjoyable in the slightest but when I got home I was pretty damn chuffed that I’d made it out and made it home without collapsing. The second run felt better – I wore my snazzy new London Marathon rejection top (yes I applied. And I was gutted I didn’t get a place… I’m like two people, half of me hates running, the other half wants to sign up for bigger, more mental events! Tough Mudder has been discussed…). Anyway, the top. It’s black, warm and comfy and it’s the first time I’ve ever run in something quite that cosy. I got into my music a bit more and relaxed into it. It was still just as hard but definitely more enjoyable.